Edwin Kelly from Specialized IRA Services to Host the Lone Star Real Estate Investor’s Expo in Houston – Lone Star Real Estate Investor's Expo – Join Us to Connect with Investors from Texas, California and Many Other States! Our featured speakers include HGTV’s newest design & real estate duo, twin sisters Alana and Lex LeBlanc (a.k.a. Listed Sisters), who help families move up the property ladder! Identical twins Alana and Lex are the ultimate combination when it comes to real estate and home design. With realtor Alana’s endless knowledge of the housing market and designer Lex’s fearless creative style, these sisters are helping their clients renovate their homes into hot properties so they can sell them for a premium and move into their dream location. Alana and Lex are the stars of the upcoming HGTV show, Listed Sisters. Lex is the founder of LAVA Home Design and Alana is a partner. 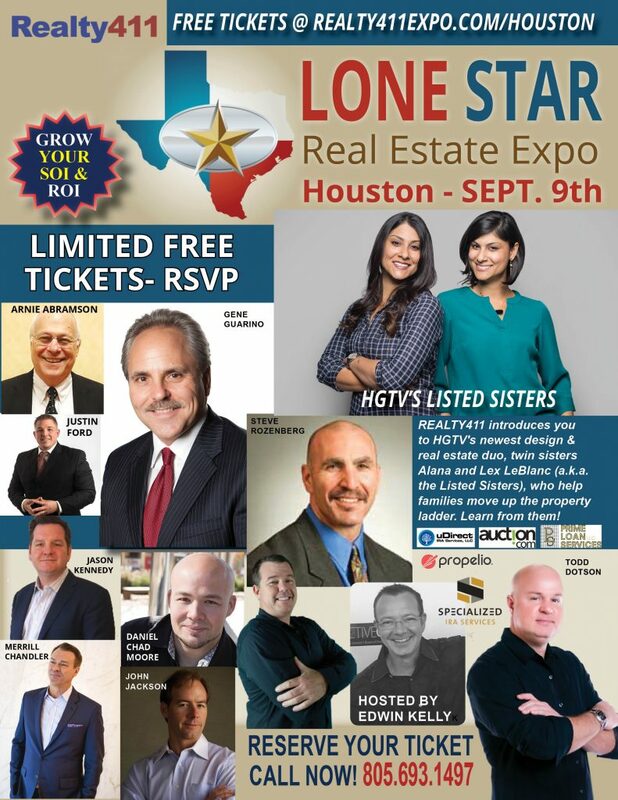 In addition to learning LIVE AND DIRECTLY from these two HGTV celebrity rehabbers, the Lone Star Real Estate Expo in H-Town also features fantastic features from throughout Texas and from around the nation! Learn from them as well as Gene Guarino, Steve Rozenberg, Justin Ford, Patrick James, Todd Dotson, Daniel Chad Moore, John Jackson, Juan Carlos Cruz,Cliff Gager, and so many more outstanding companies and people from Texas and around the nation! Don’t miss the opportunity to network and mingle with TOP INVESTORS from Texas and guests visiting from California, Arizona, Arkansas, Florida and more. A new year and new administration is upon us and savvy investors want to forecast what’s in store for them in 2017, and the next four to eight years. Our event in Houston, Texas is scheduled for September 9, 2017- Our last event united notable speakers, such as Dennis Henson, Dolf de Roos, Merrill Chandler, Phil and Shenoah Grove, and many others! Edwin Kelly is CEO of Specialized IRA Services and is considered America’s leading expert on Self-Directed IRA’s. He has more than 24 years of experience in the Financial Services Industry. He worked for such notable companies like UBS and BISYS. Edwin is a Founder and currently serves as CEO of Specialized IRA Services. Producing this community and family-friendly FREE expo is REALTY411, (http://realty411expo.com) the longest-running media and marketing company in the real estate investor space. Since 2007, REALTY411 has been positively impacting the REI industry by sharing important real estate knowledge through their publications, national expos, podcasts, and webinars. Additionally, this all day expo, which will be promoted in local media, as well as to national investors, will attract guests and company sponsors from around the country, including: Florida, Arizona, Texas, Arkansas, Nevada, Georgia and more. Expo guests will enjoy multiple breakout sessions so they can choose which topic they wish to learn about. The ballroom has been reserved for this fantastic networking expo and mixer, and complimentary coffee and pastries will be served to early-bird guests. 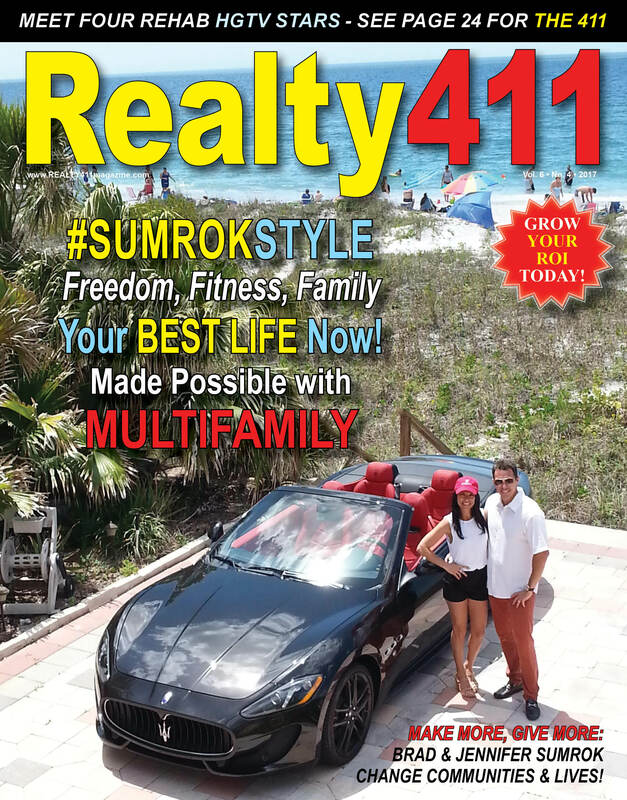 Our NEW Realty411 Features BRAD AND JENNIFER SUMROK! Get your FREE issue here and learn their Secrets of $uccess! HERE IS ADDITIONAL INFORMATION ABOUT THIS EVENT. Don’t Miss Our Second Expo and Conference in Houston, Texas! This year, our featured speakers include HGTV’s newest design & real estate duo, twin sisters Alana and Lex LeBlanc (a.k.a. the Listed Sisters), who help families move up the property ladder. Learn from them as well as Gene Guarino, Steve Rozenberg, Justin Ford, Todd Dotson, Daniel Chad Moore, John Jackson, Cliff Gager, and so many more outstanding companies and people from Texas and around the nation! Our last event in Houston united notable speakers, such as Dennis Henson, Dolf de Roos, Merrill Chandler, Phil and Shenoah Grove, and many others! LEARN FROM AMAZING EDUCATORS AND INVESTORS HERE! Residential Assisted Living Academy™ is a America’s #1 source for senior care home investment and business education. Headed by leading national expert, Gene Guarino, RAL™ Academy has trained thousands of people throughout the United States how to… “do good and do well”. Their mission is to empower investors and entrepreneurs by training them to do business with excellence and be well rewarded by doing so. Many seniors will need to live somewhere other than in their own home or apartment. Today, they are currently paying me $3000-$6,000 a month for housing and related support services. This could be you! According to Forbes, the average investor has gained only a 2.6% net annualized rate of return for the last 10 year period and hasn’t fared any better over longer time frames. The 20 year comes in at 2.5% and 30 years is just 1.9%. Those who ventured into the real estate market have seen up & down times. Some tried flipping properties for excellent profits, but chasing equity deals has become much more difficult. PLUS, LEARN ABOUT PROPELIO with the CEO! In 2008, at the age of 23, Daniel Moore bought his very first investment property. Since then, he has learned his lessons very carefully, so that, by the age of 28, he became a full time investor, and was inducted into Robert Kiyosaki’s Rich Dad Hall of Fame. He completed more than 60 properties last year alone – ranging from wholesales, rehabs, sub2s, wraps, short sales, mobile homes, and a million-dollar new construction. From this varied experience, Daniel has accumulated extensive first-hand, real world knowledge on the “how-to’s” of real estate investing. Daniel teamed up in 2014 with Nate Worcester, in order to create a software service company that would meet the operational needs of serious real estate investors. They spent two years designing and testing a unique online platform. Today, “Propelio.com” is the result of their combined efforts – delivering access to real time comps, reducing waiting time to make offers on discounted properties, to improve lead flow of motivated sellers, to keep the phone ringing, and provide a deal management system to help investors stay organized. Empire Industries, a National Award Winning Company, is a full service professional property management company servicing the greater Houston area. Whether your property is located in Spring, Katy, Houston Heights, Kingwood or even Texas City, Empire Industries Property Management has got you covered. Empire Industries Property Management is an award winning management company. Empire was a top five semi-finalist for a National Business Excellence Award for Marketing and Customer Service. We also hold the Certified Property Management (CPM) Designation from IREM, are members of the Houston Area of Realtors (HAR) and have served on the board of directors for the National Association of Residential Property Managers (NARPM). We are investors just like you! We not only manage properties, but we own a number of properties. We have been investing in Houston real estate since 2001. If you are an investor looking for properties we are a great resource, as we have contacts with different investor groups and wholesalers. * How to Track Your Expenses & Mileage Start giving your Tax Preparer the CORRECT information – This means more tax deductions and more $$ in your pocket! * It’s your money, not the IRS – Only pay what you legally owe and not one penny more! During his career, Edwin has also helped set up a Self Directed IRA provider and grow it from 2 employees with approximately 300 accounts to 15 employees with approximately 3000 accounts. Edwin has helped one Self Directed IRA Custodian to become the largest in the industry. In 7 years, he grew the company from 97 employees to 300 employees, increased the Assets Under Custody from $2 Billion to $12 billion, and participated in the successful acquisition of 3 competitors. Edwin is an avid educator, adding value to clientele by developing significant knowledge assets at every company he has worked with. His passion for helping others learn about their Self Directed IRA options has made Edwin a popular and engaging speaker who is frequently invited to speak at seminars and workshops, in webinars, and as a radio guest. Edwin has made several special appearances on the Money Show, and his work and ideas have been featured in major national magazines and newspapers throughout the United States. ** Edwin Kelly is a member of RITA (The Retirement Trust Association), attended The Ohio State University and holds an MBA from Franklin University. He is the co-author of the bestselling book Leverage Your IRA. He is currently writing his next book, The Retirement Dilemma and 7 Specialized Strategies You Can Implement to Solve It.